The new branch is the first with a bar, and it’s open late, perfect for the barhopping crowd to chow down on some nori-sprinkled fries. To conquer Mt. Fuji at Katsu Burger means to finish arguably the tallest sandwich in Seattle — an 8-inch stack with three deep-fried patties (pork, beef and chicken), three rich sauces, three cheeses (American, Pepper Jack and cheddar), bacon, pickles and other condiments, all topped with a fried egg. There are branches in Lynnwood, Bellevue and Georgetown. The fourth, opened in late December on Capitol Hill, is its most ambitious. 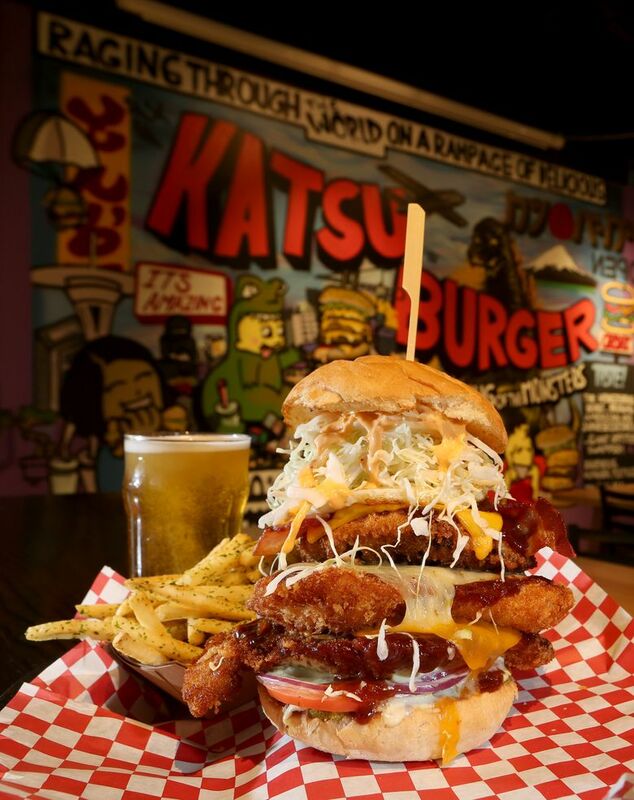 Katsu, which targets a mostly suburban demographic, is aiming for a new crowd and taking on all the debauchery that comes with opening in the wee hours in a bar-populated neighborhood. Located off the Pike/Pine corridor, this is the biggest, sleekest Katsu branch, the only one — so far — with a bar (sake, wine, beer, and soon cocktails if its hard-liquor license gets approved). It’s open until 2 a.m. on Fridays and Saturdays and may stay open even later once it gets its footing. Happy hour will be launched in the coming weeks. The setting is as colorful as the burgers — a wall mural has a Tokyo pop-culture aesthetic with Godzilla and a sumo wrestler eating giant burgers. For the uninitiated, ordering can be confusing. The menu is a visual overload with various combos, four spice options such as curry or 12 Spice and eight dipping sauces from wasabi mayo to miso honey mustard. And that’s just for the fries. The best: the nori-sprinkled fries, with a seaweed-y umami punch, kicked up with spicy mayo. Burgers are layered with different textures and flavors. “Godzilla Attack Spicy!” ($8.95), its most popular beef option, is a quarter-pound patty with a texture closer to meatloaf; it’s breaded and fried, though so overloaded with Pepper Jack cheese, jalapeño, mayo and sauces, cabbage, tomatoes, red onions and pickles that the bread coating gets soggy before you can work through the burger. And it will take a while to work through this monster. The “Ninja Deluxe” ($9.45), with a deep-fried pork cutlet and melted cheddar, follows the same rich-sauce and acidic-condiment boilerplate and is just as substantial. These are, as you can guess, richer and creamier than your usual double cheeseburger drowning in Thousand Island or some sour-sweet secret sauce. They will go down easy. And they will taste even better if you’re drunk or high. Or both.